CONVERSABLE ECONOMIST: Is the World Already Growing Sufficient Food? Research shows that at least one-third, or 1.3 billion tonnes, of food produced each year is lost or wasted - an amount corresponding to over 1.4 billion hectares of cropland. Even a quarter of this lost food could feed all the world's hungry people. According to the FAO, almost half of all fruit and vegetables is wasted each year. About 10 per cent of developed countries' greenhouse gas emissions come from growing food that is never eaten, and food loss and waste amounts to roughly USD 680 billion in industrialized countries and USD 310 billion in developing countries. This notion of food that is "wasted" can be an elusive one. After all, most food products can spoil, and they can do so in the field, in storage, in a processing or production facility, in a wholesale or retail establishment, or in a home. Calling something "waste" can involve judgments about what counts as food: for example, one of the the websites linked to this effort offers suggestions like the joys of eating fish heads. Measuring what is "wasted" is a tricky empirical problem. Indeed, the whole idea of "waste" is tricky for economists. If the food that is "wasted" has economic value--and could be sold to someone--then there would be strong incentives not to waste it. Thus, an economist is tempted to infer that "waste" really means "not worth the costs of saving it." Of course, this notion that if it had economic value, it would already have been picked up is reminiscent of a bewhiskered old joke about economists. An economist is walking down the street with a friend, who spots a $20 bill on the sidewalk. "Hey, pick up that $20 bill," the friend says. "You are misguided," replies the economist. "There can't be a $20 bill on the sidewalk, because if there was, someone would have already picked it up." In the real world, of course, there are a variety of reasons why $20 bills aren't picked up. Perhaps in the course of harvesting, transporting, storing, processing, packaging, and cooking food, there are some habits and patterns that have been handed down over time which are no longer efficient. Perhaps those who actually work in the major food storage facilities in many places have no personal financial stake in doing what is possible to reduce waste and spoilage, and perhaps those who are officially responsible for such facilities lack the vision or the financial resources to make the necessary investments. After all, there are lots of low-costs ways that people can conserve energy, but often don't bother to do so. It wouldn't be shocking if it's possible to identify lots of ways to reduce food waste, too. The websites at the FAO and UNEP talk about steps like improved storage bags, technologies for solar drying of certain crops, as well as finding uses for food that isn't cosmetically ideal rather than just throwing it away. But the alert reader will have noticed a subtle shift in the rhetoric here: a shift away from whether food is "wasted," and toward the question of of incentives and resources. Who has incentives to study the possible changes that could save food? Who has incentives to disseminate this knowledge to those in a position to act? Do those in a position to act in a way that would save food operate in an institutional structure (whether market or state-run or some mixture of the two) that provides the support and resources for making the necessary changes? When you look at the issue of food supply for the global population from this perspective, it's useful to look at all the issues: supply, technology, demand, income, and tastes. The problem for the world food supply isn't a physical inability to grow enough food. Those around the world who are severely malnourished often live in a geographic areas where the supply of food is broadly adequate for the population as a whole: they just have very low incomes and find it hard to buy enough food. Thus, a substantial part of feeding the world isn't about raising the physical supply of food, but instead raising the buying power of those who need the food most. In addition, while the world has the physical capacity to feed its population a healthy diet, the task becomes harder if the obesity rate keeps rising. 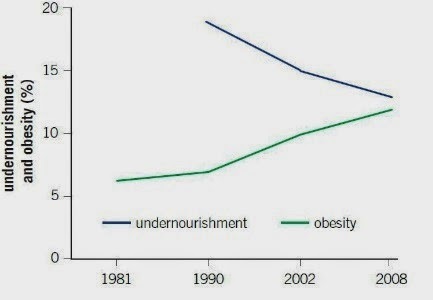 Depending on just how you measure obesity and undernourishment, it is likely that the two problems are now about the same size from a global perspective--but undernourishment is shrinking and obesity is rising. Here's an illustration from a 2013 World Bank report, showing the trends in the share of world population that is obese or undernourished. Various studies suggest that well-focused technological progress and productivity growth can create enough of a rise in food supply to cover population growth in the decades to come (for discussion, see here and here). The efficiency gains from reduced food waste at all the stages of the food production process would surely help in this task as well. But even with sufficient food being produced, the question of sufficient diets for some and appropriate diets for others will remain.